The “Descriptions” tab located in the Global Invoice Settings window controls the labels for the line items on the invoices. Use Invoice Header Paragraph – On each invoice, there is a header paragraph that serves as an opening line before the body of the invoice. These are customizable and can be templated so you can have more than one available to choose from. Invoice Description (Summary Invoice) – This text box allows you to designate a description which will display on a summary invoice by default. 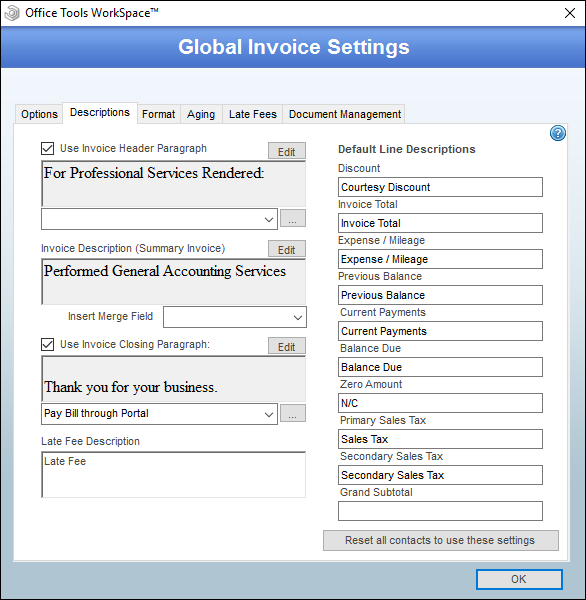 Because a Summary style invoice is void of any detail, OfficeTools WorkSpace needs to be told the description that should be displayed. As is the case with most invoice items, this can be edited on an invoice by invoice basis. Use Invoice Closing Paragraph – The Closing Paragraph follows the same principal as the Header Paragraph and allows for a closing statement to be populated on the end of the invoice. These can also be customized, templated, and chosen on an invoice by invoice basis. The fields on the right of the Descriptions tab show different lines that may appear on your invoice at one point or another. You are allowed to change the line descriptions here to match terminology that may be used in your office. For instance, instead of “Late Fees” you may refer to them as “Finance Charges”. Simply populate the desired description into the appropriate field.